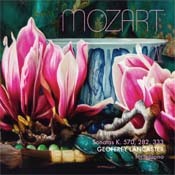 Geoffrey Lancaster is back with another disc of Mozart Sonatas. His first for Tall Poppies (TP247) delighted the critics: “Purists have condemned these performances, but I salute a shibboleth-shattering performer and a brave recording company for sweeping away 250 years of straitlaced stylistic purity and pomposity. I will never be able to listen to these familiar pieces in quite the same way again.” Vincent Plush, The Australian, January 2018; and Andrew Ford opines: “The point is that this CD demands to be heard and will force you to think about Mozart and his music. Lancaster, I imagine, would say that this is the only reason he performs.” Inside Story, December 2017. Including a unique Prelude for each sonata, Lancaster plays these three works with virtuosity, humour, clarity and sincerity. You might think this an odd way to describe a performance, but Lancaster embodies all these qualities and proves his outstanding musicianship along the way, and is thus out on a limb in Australian music-making. You’ve just got to have a listen! The disc is rounded off with a deliciously colourful cover image from Melbourne artist Dean Home. As I listened to fortepianist Geoffrey Lancaster’s recently released compact disc recording devoted to three of Mozart’s keyboard sonatas, I wondered how some of my colleagues would respond to his approach to these works. For those for whom a strict, unwavering beat (apart from a rit at the end of this or that section of the work) is a non-negotiable requirement, Lancaster’s recordings could well trigger apoplectic responses from those unable – or unwilling – to accept that these sonatas are presented in a way that was standard practice during the composer’s lifetime and for a long time afterwards. As a young grand-pupil of Lili Kraus, I accepted without question that, in Mozart or Haydn, a steady beat, with hands strictly co-ordinated, was de rigueur throughout. This is ever present in the Mozart recordings of, say, Walter Gieseking whose performances were – and still are for millions of listeners – considered the last word in the way to play the works of the Salzburg master. I’d like to think, though, that even this very great artist, after careful consideration, might have conceded – at least in part – the validity of Lancaster’s revivifying approach to Mozart. I hope these recordings receive a very wide listenership. They deserve it. In his retrieval of near-forgotten historic performing modes, Lancaster’s offerings warrant the highest praise and the widest listenership. This compact disc is a compendium of marvels. Even the least important succession of notes is treated with utmost care and, always, infused with beauty of tone and expression. These performances are a joy from first note to last. I look forward very much to Lancaster’s recordings of more of Mozart’s sonatas – each one prefaced by what comes across as if it were an on-the-spot extemporisation by the soloist, a procedure that was standard practice at the time Mozart’s sonatas were being written. As ever, Lancaster’s liner notes are a joy to read. They ought to be required reading by anyone preparing a Mozart piano work for performance. I am certain that I am not the only listener looking forward with great anticipation to Lancaster’s next recording of the keyboard sonatas of Mozart.